President Donald Trump’s positive ratings were up very slightly, from 28 percent in the previous survey to 29.7 percent in the latest measure. Michigan Gov. Rick Snyder received favorable ratings from 26.3 percent of Michigan residents. At the same time, Michigan residents were highly optimistic about their current household finances. Those who called themselves better off than a year ago outnumbered those who said they were worse off by two to one. More than 60 percent forecast they’d be better off a year from now, said Charles Ballard, MSU economist and SOSS Director. 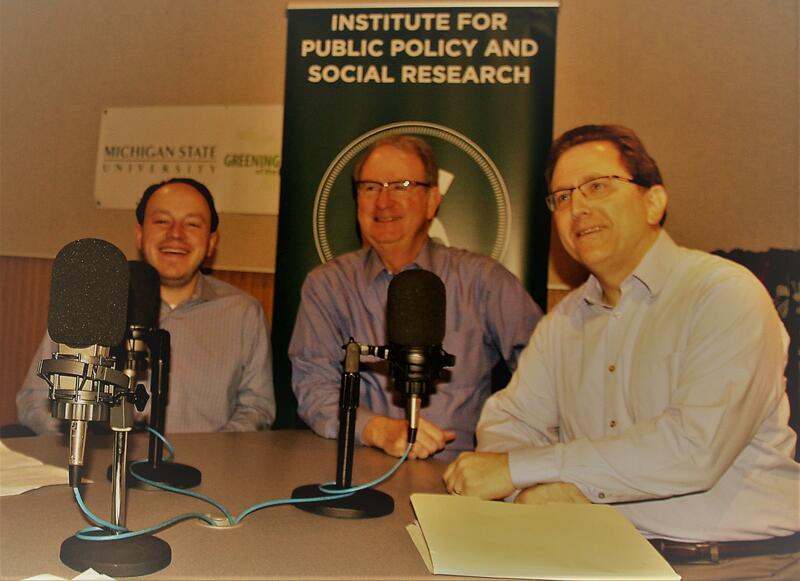 Ballard joins IPPSR director and MSU political scientist Matt Grossmann and IPPSR associate director Arnold Weinfeld for a conversation on the survey results. SOSS results were announced during this State of the State Podcast, a new policy-focused broadcast heard over ITunes, SoundCloud, and radio stations throughout Michigan. These results came from the 75th round of SOSS. Questions were asked Michigan residents over the age of 18. SOSS is the only survey conducted in Michigan designed to systematically monitor the public mood on important issues in major regions of the state. SOSS results were announced during the State of the State Podcast, a new policy-focused broadcast heard over ITunes, SoundCloud, and radio stations throughout Michigan. The survey, which includes both landlines and cell phones, interviewed 963 people between Sept. 14, 2017 and Jan. 18, 2018. The survey carried a margin of error of 3.16 percent. See a full analysis of SOSS results at http://ippsr.msu.edu. The State of the State Survey is administered by MSU’s Institute for Public Policy and Social Research and conducted by IPPSR’s Office for Survey Research. IPPSR is a unit of MSU’s College of Social Science and specializes in public policy education and analysis, political leadership training, and survey research, and is a hub of policy education for students, faculty, and public and private researchers across the nation.